For other uses, see Gold rush (disambiguation). 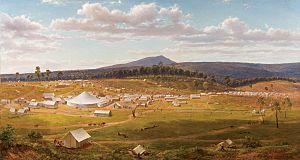 Ballarat's tent city in the summer of 1853–54 oil painting from an original sketch by Eugene von Guerard. A gold rush is when a lot of miners go to a mining place full of gold. Well-known examples are the California Gold Rush of 1849, Klondike Gold Rush in the 1890s, and the Australian gold rush which began in 1851. While gold mining itself didn't make much money for most diggers and mine owners, some people made large fortunes. Gold rushes helped spur a huge immigration that often led to permanent settlement of new regions. 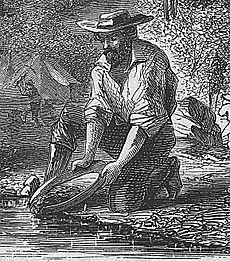 Activities propelled by gold rushes define significant aspects of the culture of the Australian and North American frontiers. At a time when the world's money supply was based on gold, the newly mined gold provided economic stimulus far beyond the gold fields. Gold rushes extend as far back to the Roman Empire, whose gold mining was described by Diodorus Siculus and Pliny the Elder, and probably further back to Ancient Egypt. 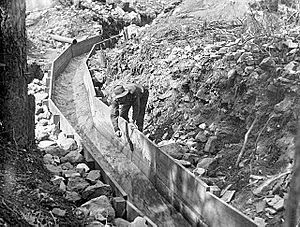 A man leans over a wooden sluice. Rocks line the outside of the wood boards that create the sluice. 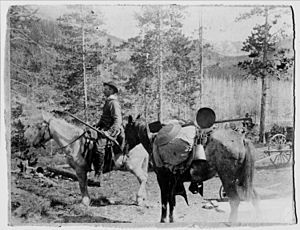 Swedish gold panners by the Blackfoot River, Montana in the 1860s. 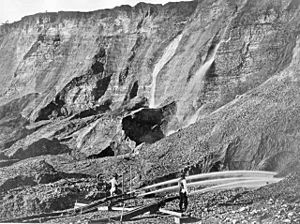 Jets of water at a placer mine in Dutch Flat, California sometime between 1857 and 1870. A rush begins with the discovery of placer gold made by an individual. At first the gold may be washed from the sand and gravel by individual miners with little training, using a gold pan or similar simple instrument. Once it is clear that the volume of gold-bearing sediment is larger than a few cubic metres, the placer miners will build rockers or sluice boxes, with which a small group can wash gold from the sediment many times faster than using gold pans. After the sluice-box stage, placer mining may become increasingly large scale, requiring larger organisations and higher capital expenditures. Small claims owned and mined by individuals may need to be merged into larger tracts. Difficult-to-reach placer deposits may be mined by tunnels. Water may be diverted by dams and canals to placer mine active river beds or to deliver water needed to wash dry placers. The more advanced techniques of ground sluicing, hydraulic mining and dredging may be used. The free gold supply in stream beds would become depleted somewhat quickly, and the initial phase would be followed by prospecting for veins of lode gold that were the original source of the placer gold. As the miners dig down, they may find that the deeper part of vein contains gold locked in sulfide or telluride minerals, which will require smelting. If the ore is still sufficiently rich, it may be worth shipping to a distant smelter (direct shipping ore). Lower-grade ore may require on-site treatment to either recover the gold or to produce a concentrate sufficiently rich for transport to the smelter. As the district turns to lower-grade ore, the mining may change from underground mining to large open-pit mining. Many silver rushes followed upon gold rushes. The fastest clipper ships cut the travel time from New York to San Francisco from seven months to four months in the 1849 Gold Rush. Gold rush Facts for Kids. Kiddle Encyclopedia.